Allbreeds Herding UK | A.B.Herding...Has it any future in UK? A.B Herding...Has it any future in UK? YES YES YES! I am a judge!!! To earn the 'title' from the AHBH dogs must have got enough points in two runs under two different judges. if just one run qualifies its recorded as Leg 1 and you can add the next at a different trial. So 16 out 17 earned at least one leg in their class. We also had three Pyrenean sheepdogs who did not enter trials but did a demo run and some instinct testing that quite impressed the judges. So 19 dogs with 12 handlers supported this new venture. Reegan Ray I think there is something for everyone in these courses. the arena courses are very doable for beginners to fetch through and learn some basic stock handling and reading skills, and the field course offers a nice challenge for more advanced dogs that can drive and pen and shed without the extreme distances of your border collie trials. But even the beginning level field course can be a great way to start a dog trialing because you may leave your dog at the handlers post and go within a short distance of the sheep to send him on the outrun. Then you can fetch and end with penning, no shed. Trial practice in mini bites and recognition for the pieces toward the bigger goals. The thing that struck us when we were in the U.K. is you pretty much need to jump into trialing at a very high level. Which is wonderful...but it's also fun to exhibit a good dog and a good relationship along the way? With a first stage trial for interested UK handlers, (Fri 22-9-17) either interested in improving good working stock dog, training a less well know breed or even competing in ISDS trials. We too can do this... ? Highlight n left click, choose middle option to see a young boxer trialing in USA! High light link and left click; choose middle option... to see Australian Shepherd trialing in U S A! Every one in the world will hold passionate opinions about all these questions, and almost all will be in opposition to each other. Many will form their opinions from romantic notions about independent workers bounding through mountains of heather, taking their beloved master's sheep to market all by themselves,saving a small child from a river on the way back and winning a Sheepdog of the North trial the next day. Some will watch a few One Man and his Dog programmes on telly and decide that if they can only micro manage their dog they too will be up there as stars. One or two will know from experience what their 'line' of dogs is likely to be, because they will have selected for the characteristics they prefer to work with, day to day. Some will just take their dog to sheepdog handling classes hoping like hell that they get a trainer who can help them achieve their own ambition, what ever that may be. Bottom line is, you can only work with what the dog offers, with the facilities you have, and understand very clearly that in the end the dog is what you can help him or her be! Train the dog in front of you, not the breed! A wonderful summer is drawing to a close. We’ve had the weather, the dogs, the trial successes, the litters of puppies, the chance to work our dogs on sheep...even if they are not the ‘normal’ sheepdogs. 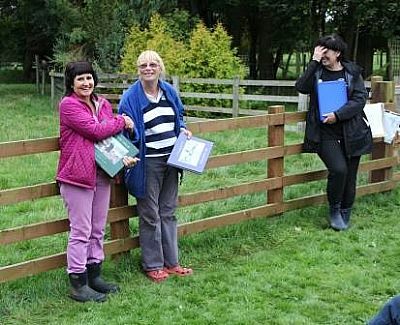 At Glebe Farm, it’s time to sit back and assess the summer’s classes, clinics and one to one training times we have all enjoyed. For twenty years I have been involved with helping a small number of people with the less common herding breeds to manage sheep. I am about to assess the next stages, if any, and my continued involvement in them, if any. Really, the future of All Breeds herding in the UK is , as ever, up to you. You, with your passionate, determined, highly individual approach to your dog, your needs, your own driving ambition. Or, often, the simple enjoyment of the learning process, of watching a dog reveal skills not often seen, a deepening of your partnership. There are too few of you, and your goals so surprisingly different from each other’s, to make the K C’s tentative approach examining accreditation for herding with other breeds seem practical, or even particularly desirable. Glebe Farm has always muddled along on a friendly, informal basis, a highly unprofessional approach that has usually worked really well. It gives me such pride and pleasure to see a dog and owner manage our training sheep nicely. It would give me even more enormous pride and pleasure to see each and every one of you clutching certificates of merit from some illustrious body of people qualified to acknowledge the continued instinct present in your particular breed, and your increasing levels of skill in the management of stock. Of course A B Herding does have some sort of future, but what that is would seem to depend on the persistence, tact, willingness to link with each other and sheer enthusiastic good will of the people wanting to give it one! A good dog is a good dog.... If not we will teach them.. Dogs that control stock with body and precenece rather than eye. We can handle up to 12 handlers a day, depending on the amount of stock and pens/fields. The best is if a handler can attened two days, but you can set it up like a kind of herding test..
What is the closest airport to Jackie? You can also plan for a seminar on morning or evening time for two hours..
<<"Jackie have a barn we can sleep in, no rain under roof and warm in june. Two folding/field beds are okey... we can eat at the pub We try to cut the cost, so we can have as many as possible to attend. In the first morning we like to start with theory and a presentation of each handler for 30-60 minutes, at this time I hand out a compendium which we walk trough... after this we like to see your dogs and how you handle them, leadership and so on, outside the stockarea. Then we sort us in to two groups and start training the handlers to handle their dogs... makes sense? I will house and feed both of course! I LOVE this man already... his dogs must also come! Ps send him link to our website!